January 2010, our last year living in Los Angeles, I took a six mile walk from Sunset Blvd & the PCH to Pico & 14th Street, Santa Monica. Looking south along the coast towards Santa Monica. A beautiful, sunny winter day in Los Angeles. As I've shared previously, ironically winters are usually sunnier than late spring/early summer. Zoom lens from the same spot. 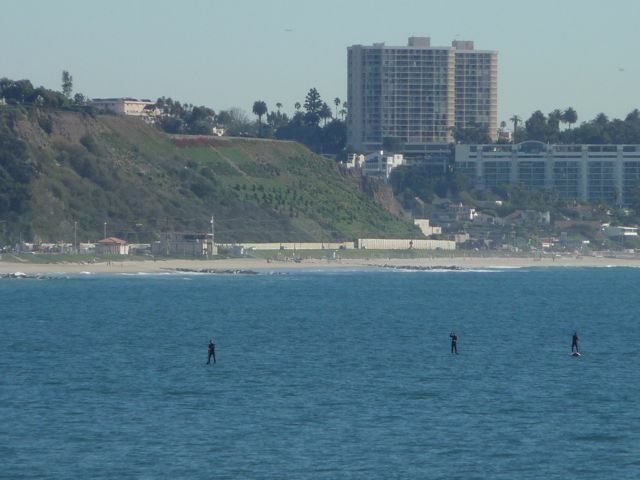 Three stand up paddle boarders enjoying a Saturday in January. Santa Monica Canyon two miles away: gym with huge open window. Great anytime, awesome in January. 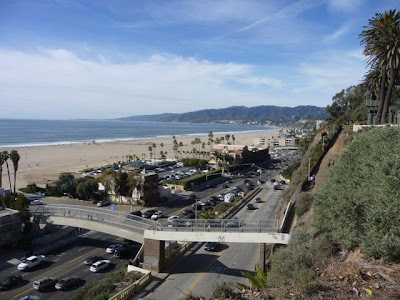 Up a flight of stairs from the coast to the bluffs (technically, "palisades") of Santa Monica. Incredible, amazing succulent plants. These are Agave Attenuata, also called Lion’s Tail, Fox Tail, or Swan’s Neck Agave. 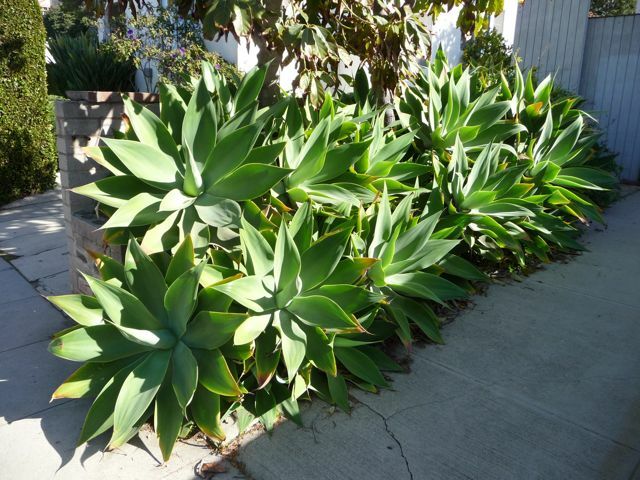 When my family first moved to Los Angeles from Chicago in the late 1960's, plants like this looked like something from Mars. In a sense, they still do. Looking south from the bluffs of Santa Monica, across the bay towards the Palos Verdes Peninsula and (barely visible in the distance) Catalina Island. 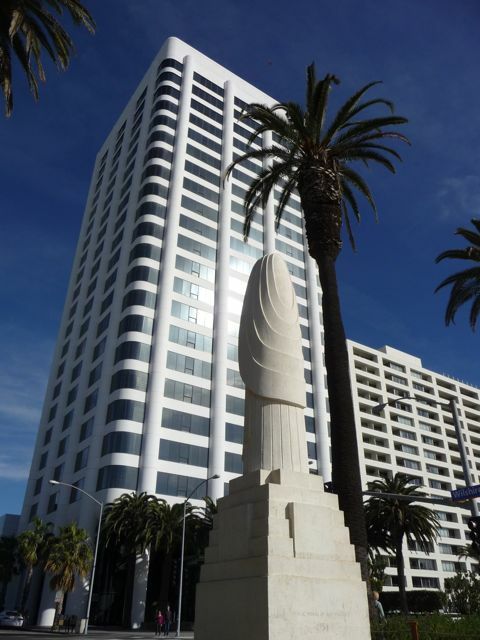 Two condo towers at the corner of San Vincente Blvd and Ocean Avenue. 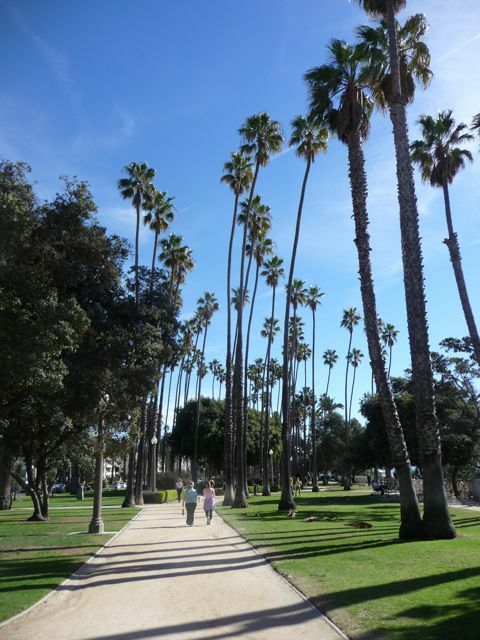 This part of Santa Monica is beautiful, but living here ain't cheap. A 900 square foot 1 bedroom, 1 bath condo goes for $1.5 million. That's not for a house, but for a condo. Yikes. 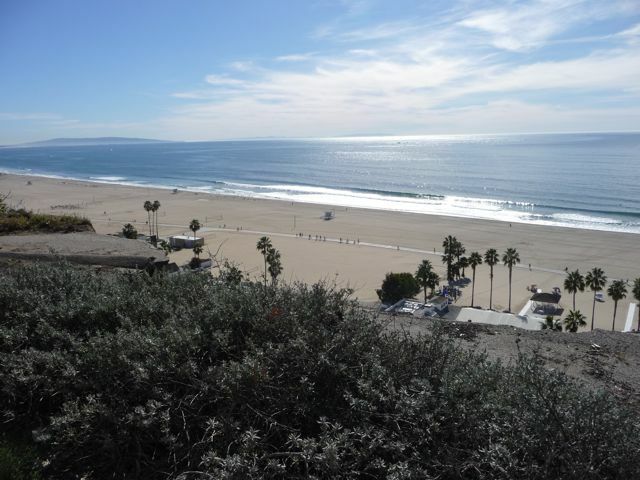 Another view from the bluffs looking south towards the Santa Monica Pier. 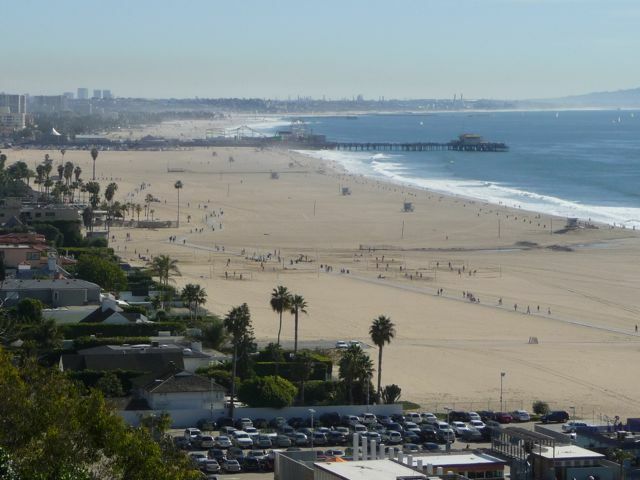 A closer view of the Santa Monica Pier. Here's a link to previous post highlighting the Pier. If you look closely the 18 mile coastal bike path is visible. 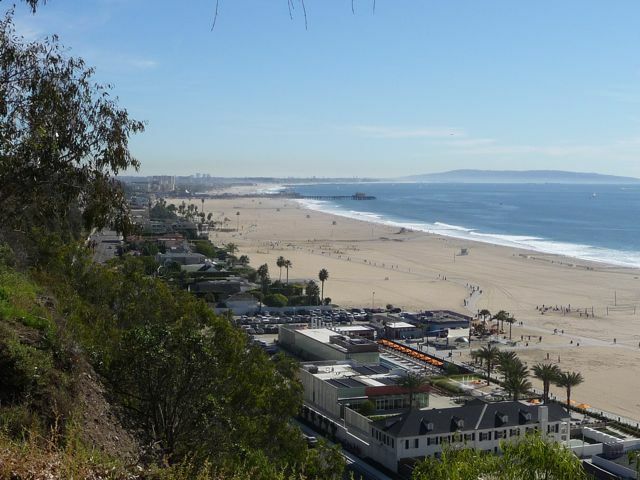 This is Santa Monica's Palisades Park, which allows for incredible views along the bluffs for two miles. More fantastic specimens of Agave Attenuata. Amazing. 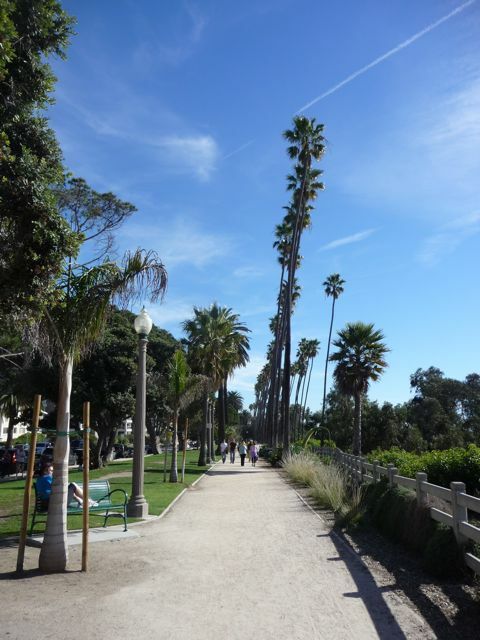 Enjoying Palisades Park. 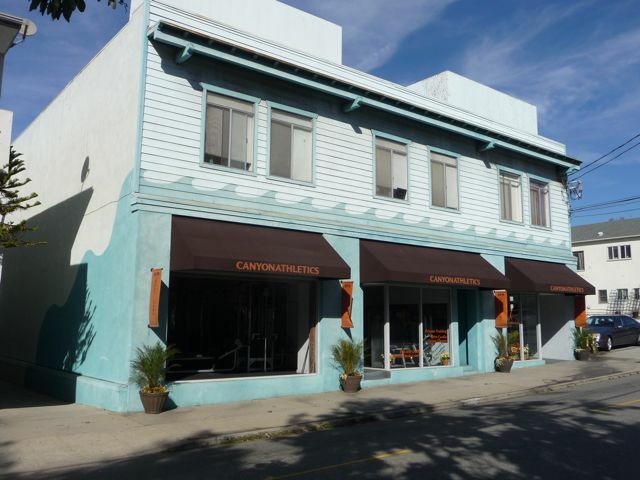 This was the first weekend in January and on this "chamber of commerce" day I saw dozens of tourists in town for the Rose Bowl. 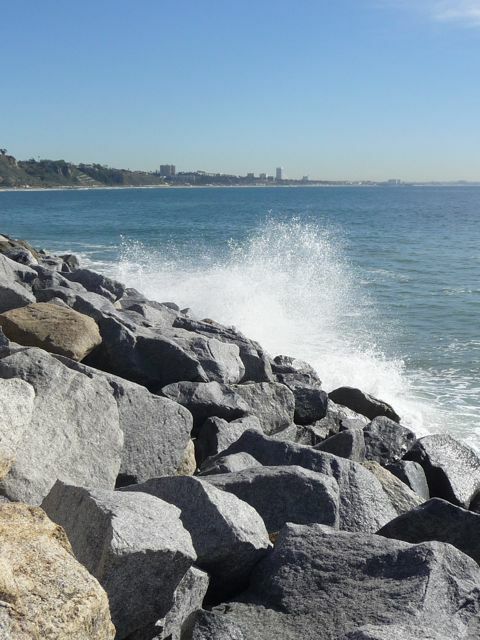 Looking north from the bluffs towards the communities of Pacific Palisades and Malibu. Tons of people out and about enjoying a beautiful day. Dog walkers, old people, young people, families, lots of singles. Good times. 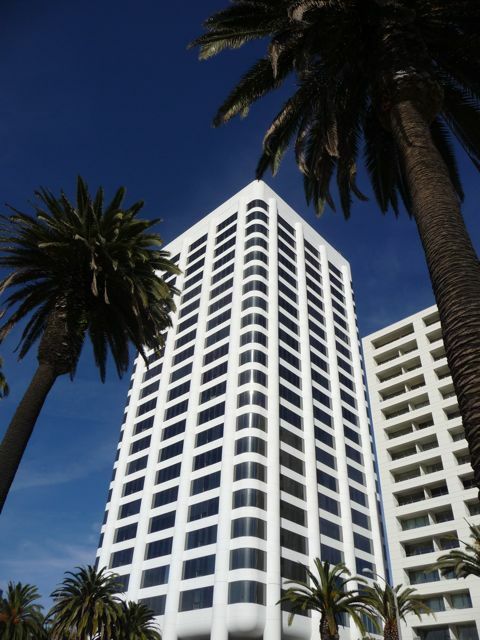 At 14 stories, this is "100 Wilshire Blvd" - Santa Monica's tallest office tower located on the corner of Wilshire Blvd and Ocean Avenue. 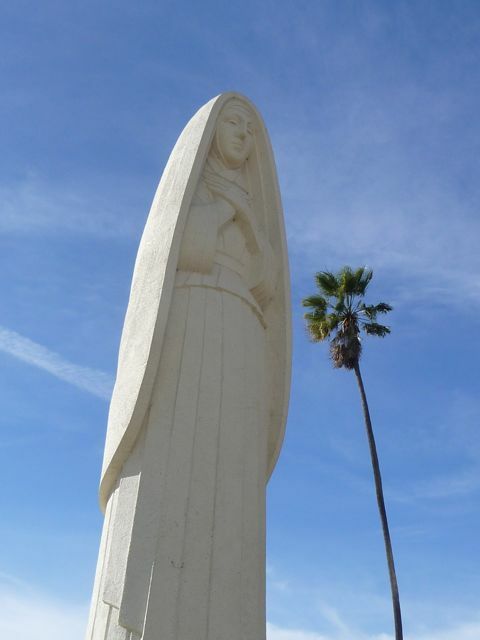 The statue is Santa Monica (Saint Monica) looking towards the city. 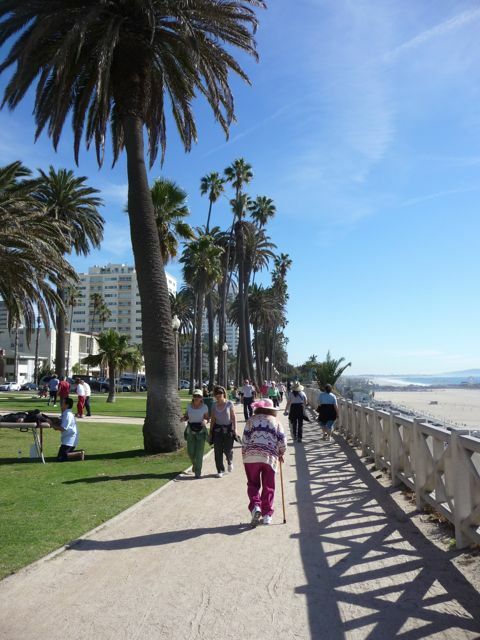 Another view of Santa Monica, or Saint Monica. Monica was the mother of 5th Century theologian Saint Augustine. More succulents. 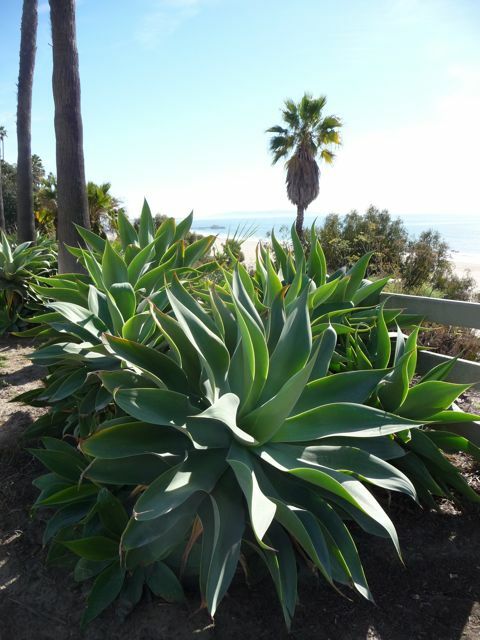 Coastal Los Angeles is the capital of succulent plants. 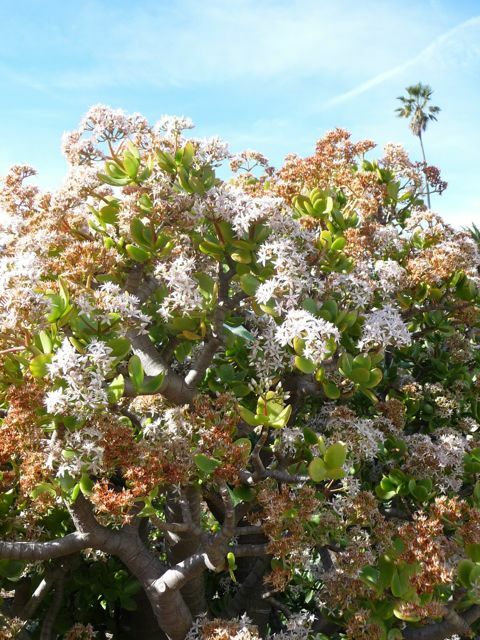 This is Crassula Ovata, commonly known as Jade Plant, Friendship Tree, Lucky Plant or Money Plant. Another view of 100 Wilshire. Love the palm trees. 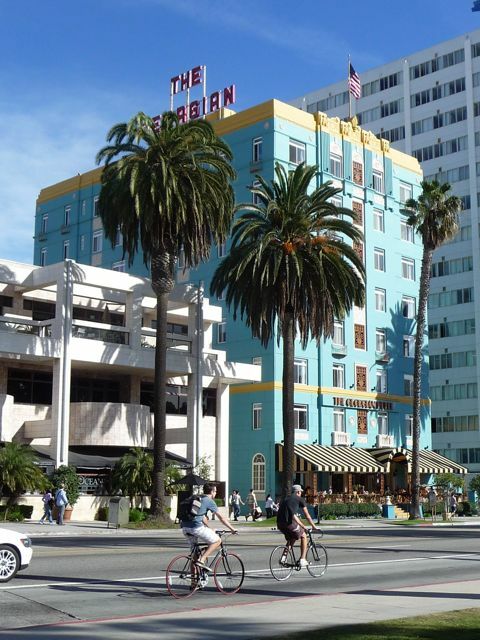 Built in 1933, The Georgian is a beautiful, historic hotel on Ocean Avenue. 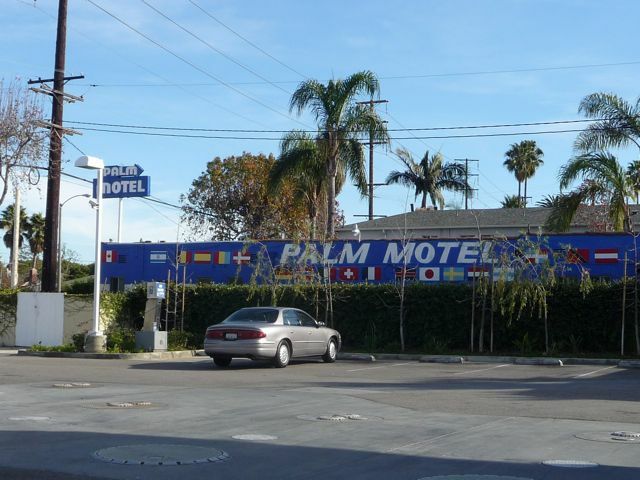 Like pretty much everything in Santa Monica, lodging is NOT cheap. 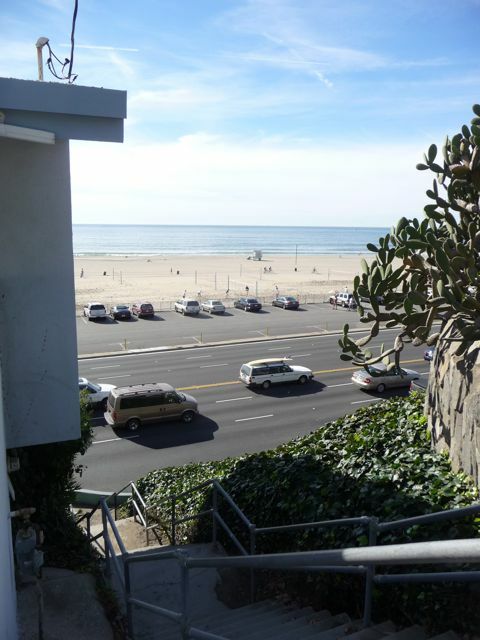 Rooms off season (if there's such a thing in Santa Monica) start at $400 a night. 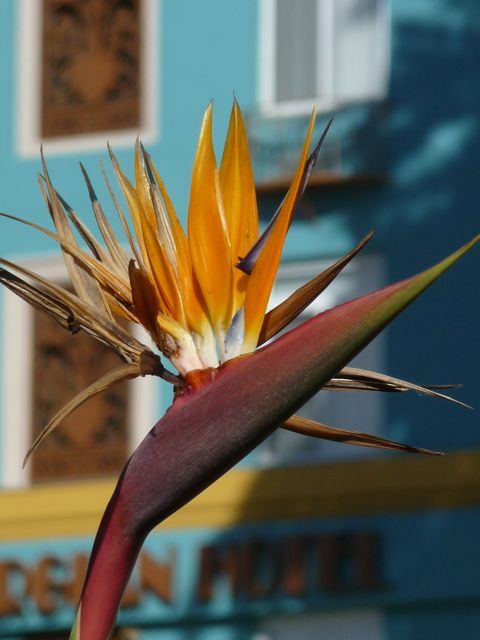 Fantastic "Bird of Paradise" flower - native to South African - with The Georgian Hotel in the background. Heres' a link to a previous post with some additional photos and info. 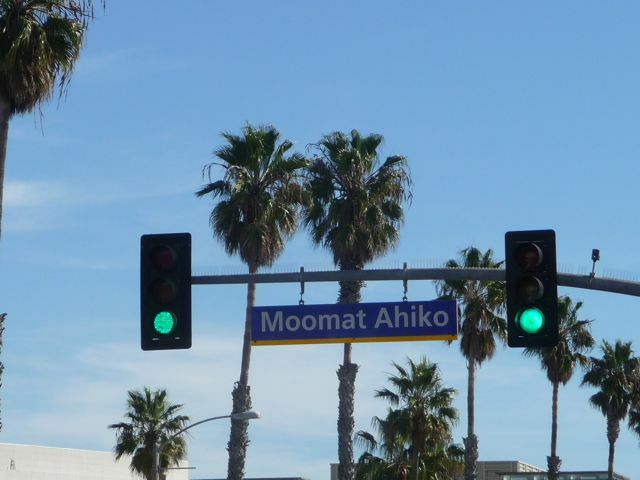 Moomat Ahiko is the name of very short street next to the Santa Monica Pier, providing access from Ocean Avenue to the Pacific Coast Highway. It means "Breath of the Ocean" in the native Tongva language. 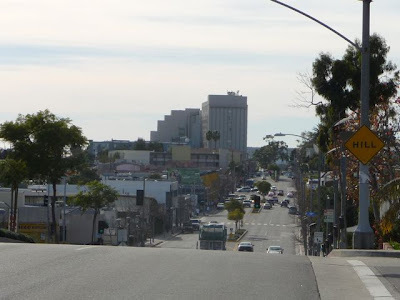 Walking up Pico Blvd (to be explained later) I passed the Bay Shore Lanes. This place has been here for ever! 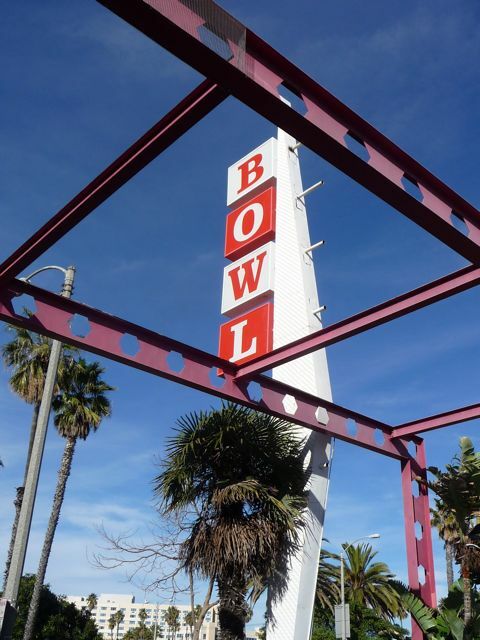 I remember learning to bowl here as a kid, back in the early 1970's. Based on the cool googie architecture, I'm assuming this place has been around since the early 1960's. Another view of the sign and retro architecture. 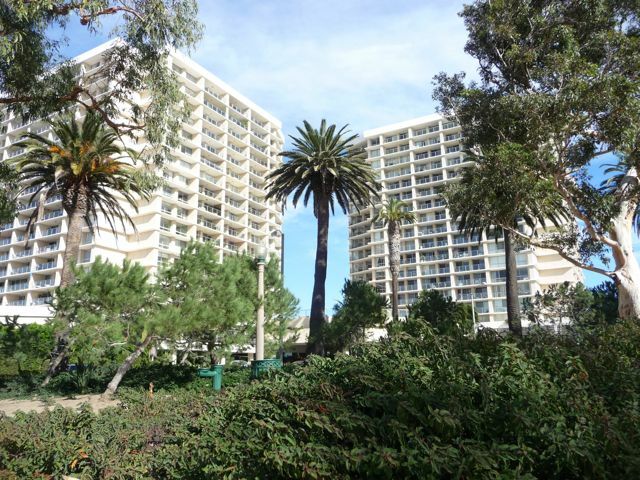 This reminds me of the earliest incarnation of the Disneyland Hotel down in Anaheim. Tommy's Burgers: what I refer to as "blue collar In and Out." Not necessarily healthy, but delicious. 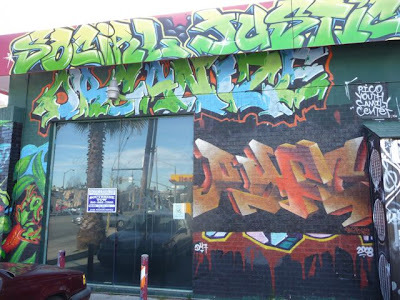 Here's a link a previous post at their original location - "The Shack" - at Beverly and Rampart in Los Angeles. 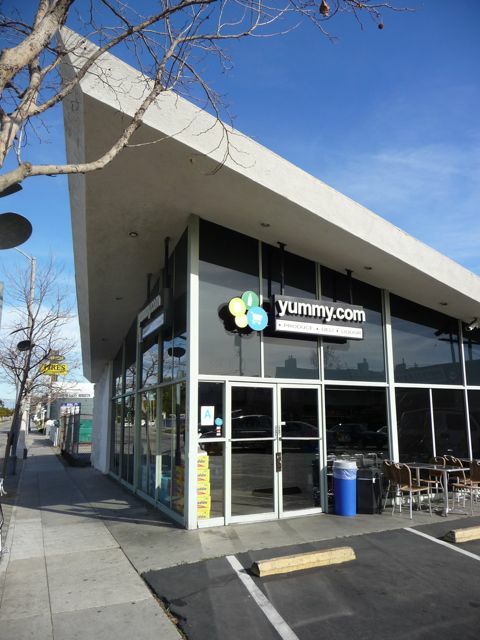 Yummy.com - a small local chain with free delivery. 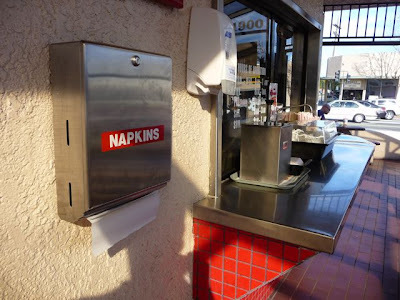 This was taken five years ago, apparently they're still in business. Good for them. More retro architecture. The Palm Motel - at Pico and 14th Street. Every summer, the college campus ministry I work with hosts a student leadership development program, housed here. Students live here, have regular 9-5 summer jobs in the community, and on evenings and days off are involved in community service and outreach. 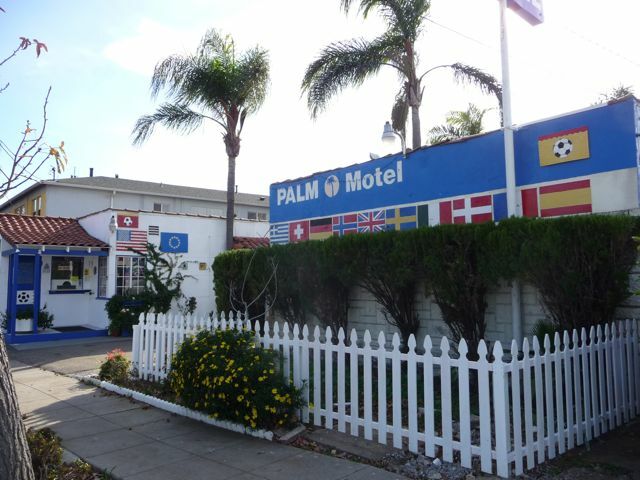 During the rest of the year, the Palm is an youth hostel. The students live here during the summer (the adult leadership lives off site a couple miles away). It's a great place for students. A bit rustic, but it works - and is within our price point. 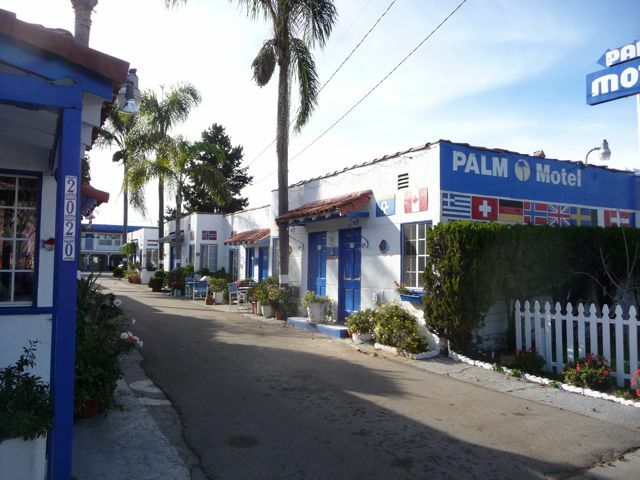 The owner and management is great - working with us year after year. View along Pico walking back toward the beach. 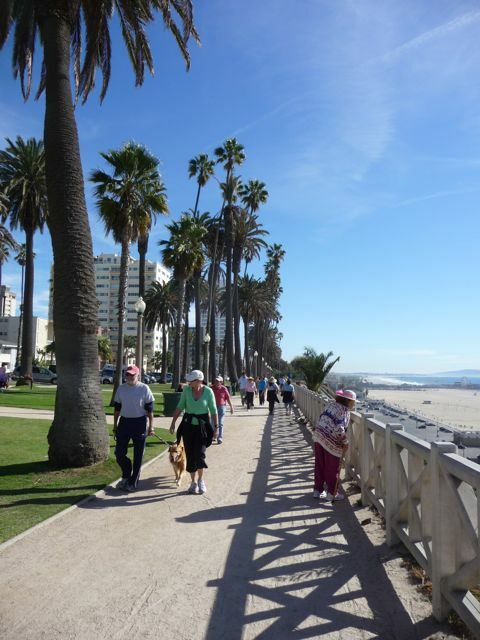 Santa Monica describes itself as an urban beach town. Very true. 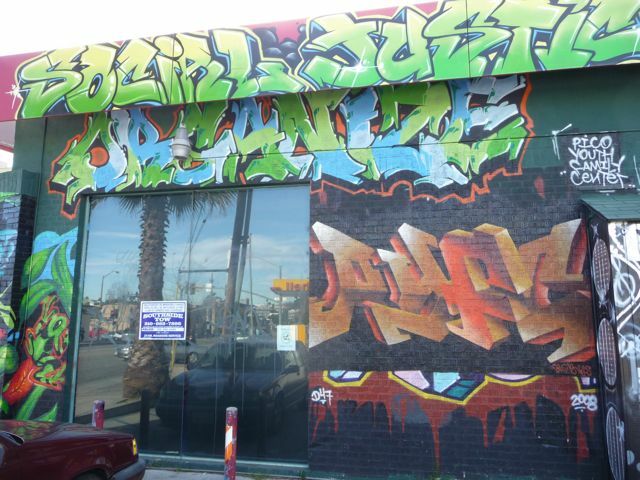 Artwork at the Pico Youth and Family Center. Anther view. As I've commented before, I've driven by this location dozens, perhaps hundreds of times. It is was only when I got out of my car and drove around that I ever noticed it. I have friends who will run a half marathon or full marathon - both of which I find incredible. Yet these same people find it incredible that I walk five or six miles thought the city. 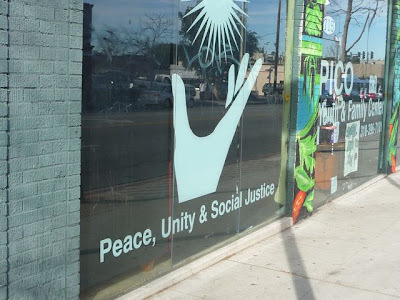 Speaking of which, here's some link to some previous blog posts on walks along Pico Blvd, Main Street (in Santa Monica), Abbot Kinney Blvd (in Venice), Santa Monica Blvd, Wilshire Blvd (in Beverly Hills), Hollywood, Silverlake and Downtown Los Angeles. Peace, Unity and Social Justice. As a follower of Jesus Christ, I'm absolutely committed to these same things. My guess is that I might have different opinions of how to obtain these three things. But - hopefully - there's also some common ground. Santa Monica High School at Pico and 6th Street. 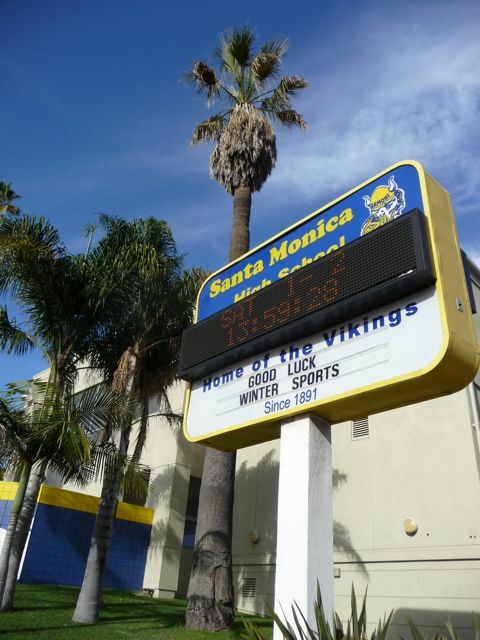 Notable alumni of "Samo High" include Glen Ford, Sean Penn, Robert, Downey Jr, Emilo Estevez, and Charlie Sheen. Which, is not lost on the private tour buses driving along Pico - to the Beach. Really? 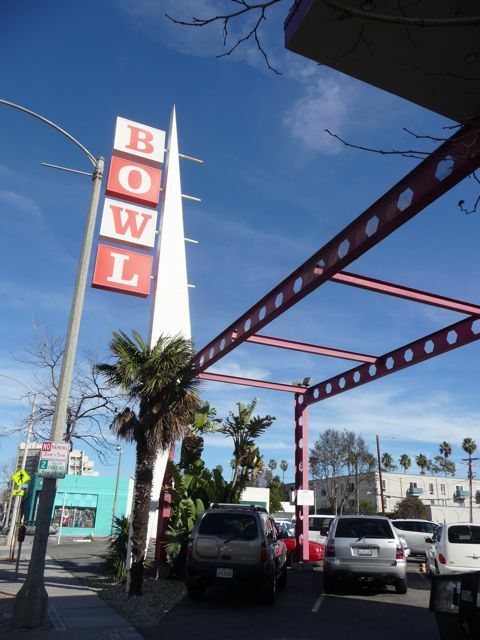 This stretch of Pico Blvd is NOT Hollywood, not Malibu, not Beverly Hills. But I guess the folks at the Starline "hop on, hop off" bus tour must think otherwise. The distinct double decker buses look fun. At $39 a day, I've never tried this. I'm assuming you're NOT paying for transportation as much as the on-going speel about Los Angeles. 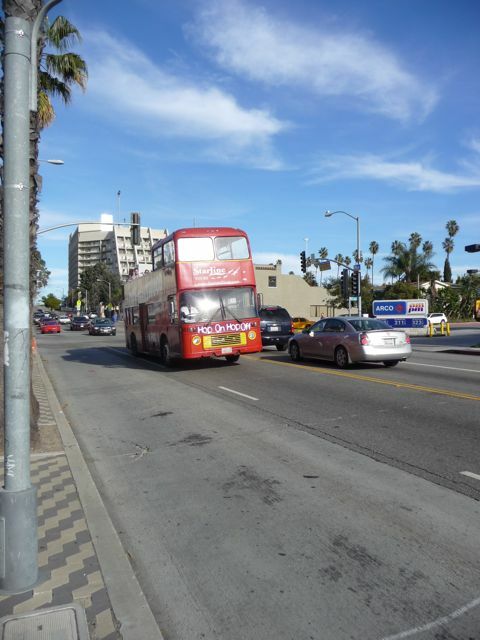 Instead, for one dollar I took a Santa Monica "Big Blue Bus" back to Sunset and the PCH ... and called it a day. Long walk. Good times experiencing Los Angeles. That'd be true anytime of the year, but especially true on a Sunday afternoon in January. Tommy burgers! Lol. ... why did you leave L.A? If I may ask. Beautiful photos. "why did you leave L.A.?" Job transfer about five years ago. 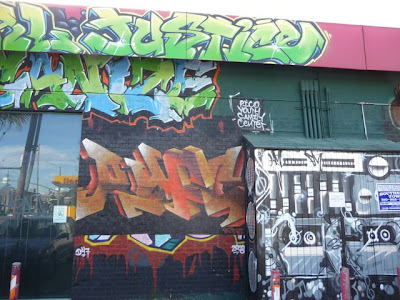 Started this blog when we lived in L.A. ... figured I'd stop posting when I finally ran out of photos from our time there. I still have a few more photos to post. But now time's an issue (the photos = easy, the commentary = takes a lot more time). Year old post, but I had to comment. The Tommy's on Pico and Lincoln is gone! It's been replaced with a Starbucks. 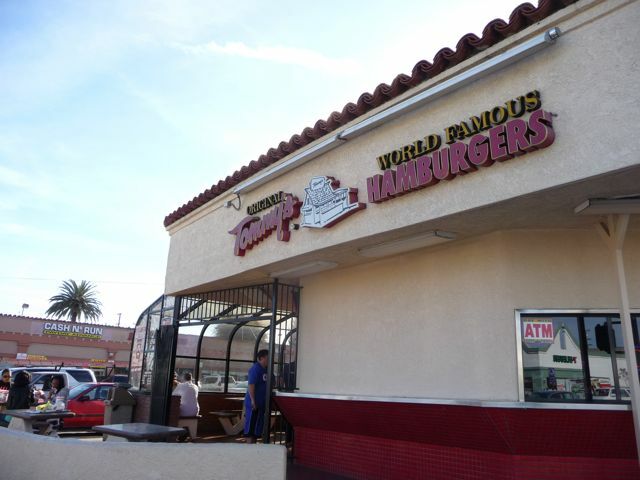 The closest Tommy's is now Van Nuys. :-( L&L is still there so one can still get a heart attack. Thanks for the update about Tommy's at Pico Lincoln being replaced by (yet another) Starbucks. Too bad.